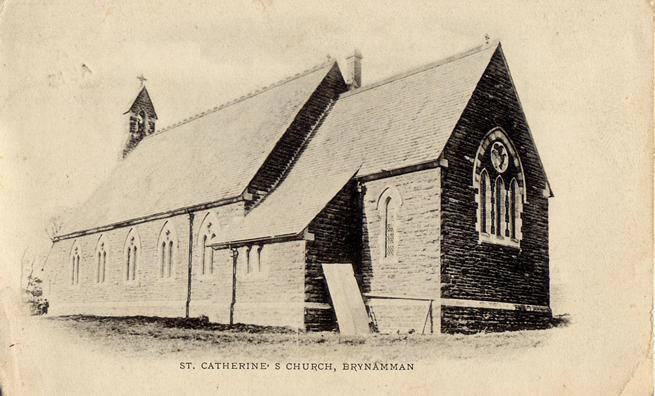 St. Catherine's Church, Brynamman c.1906. Saint Catherine's Church at Brynamman was the first daughter church to be built in Cwmamman Parish after the main church was built at Garnant in 1842. St. Catherine's Church was built on land which was once part of Cwmnantymoel Farm in 1882, by Balcombe & Price of Pembroke Dock. The architects were Edwin Henry Lingen Barker (Hereford) and John Hay (Liverpool). The consecration of St Catherine's Church took place on Friday the 15th of July, 1881, by the Right Reverend William Basil Jones; Lord Bishop of St Davids. The first vicar of Brynamman Church was Rev. David Griffiths. Eight years later, by order of the Church Council dated the 6th of April, 1889, all of that part of Llangadock Parish which had previously become part of Cwmamman Parish became the new Parish of Brynamman. St. Catherine's then became the parish church. Cwmllynfell and contiguous areas became part of Brynamman Parish on the 9th of March, 1905. On Wednesday, the 10th of July, 1940, a fierce air battle took place between British fighter aircraft and German enemy bombers over the English Channel. Over 150 planes were involved and between 400 and 500 bombs were dropped on English towns along the channel. Fourteen enemy planes were shot down and twenty three were severely damaged. Some of the escaping enemy aircraft headed in the direction of South Wales, pursued by British fighter planes. Bombs were dropped over Welsh towns, with one community suffering nine deaths. Just before midday, one plane was spotted flying low over the L.M.S. railway line towards Brynamman. It is assumed that the German aircrew saw the chimney stacks of the old brickworks, two railway stations and the marshalling yard; for the plane was seen to swing in a northerly direction. The Bomber then approached the village from the North. Their bomb, however, missed their supposed target, landing in the churchyard, south of St. Catherine's. The massive explosion caused damage to several houses in the vicinity, but the church took the full force of the blast, causing severe damage to the church windows and roof. The church building, however, served as a shield, protecting the 300 children at Brynamman Council School which was then sited approximately only 50 yards (metres) behind the church. It is remarkable that not one teacher or child was hurt at the school. The bomber was last seen in the region of Burry Port, with smoke pouring from it's tail, following a terrific battle with the three persuing British fighter planes. Whether it crashed or whether it reached home safely is not known. Information for this page was taken from "A Brief Survey of the Ecclesistical Parish of Cwmamman", by Rev. Tudor O. Hughes, B.A. ; Vicar of Cwmamman, which was published for the centenary of Cwmamman Parish Church. Other sources include a sermon by Rev Adrian Teal to mark the 50th anniversary of the Bombing of St. Margaret's Churchyard on 10th July, 1990.